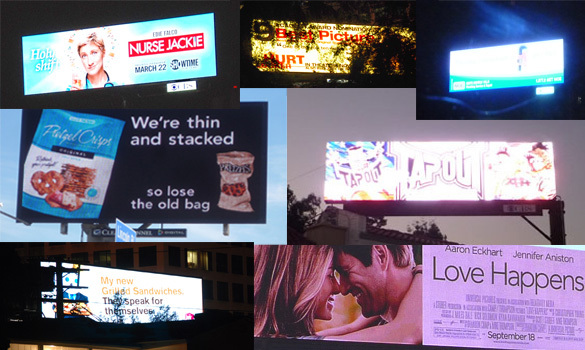 » Will L.A.’s Digital Billboards Be Going Dark? And If So, When? Will L.A.’s Digital Billboards Be Going Dark? And If So, When? Yesterday’s California Appeals Court decision ordering the revocation of permits issued for 100 digital billboards in Los Angeles was ample cause for celebration by those who have been saying since 2006 that the backroom deal struck with Clear Channel and CBS Outdoor to allow more than 800 of the brightly-lit signs with their rapidly changing messages was illegal because it violated the city’s own ordinances. But to quote the inimitable Yogi Berra, “It ain’t over ’til it’s over.” And “over” in this case could be awhile, given the billboard companies’ deep pockets and their propensity to pursue litigation in their quest for profits and the holy grail of more and more digital signs. And then there’s the political arena into which they deploy a phalanx of lobbyists, one of whom recently wrote a City Council motion dealing with the very issue of those 100 threatened billboards. First, the legal landscape. The next obvious avenue for the companies’ lawyers is to petition the California Supreme Court for a review of the Appeals Court ruling. That could result in any one of three outcomes–the Supreme Court could decline to hear the appeal, or it could hear the appeal and either uphold or overturn the Appeals Court ruling. The Appeals Court ruling actually directs the Superior Court judge who made the initial ruling in the case back in 2009 to issue an order requiring the city to revoke the digital billboard permits. How soon that will happen is difficult to predict, but one thing is certain. Once those permits are revoked and the billboard companies officially notified, they will have a set length of time to bring them into compliance with the current city ordinance which prohibits such signs. And if they don’t? In the absence of a stay or some other order from a court, those billboards will be operating illegally and subject to daily fines. Right now, that fine would be a maximum of $100 a day, an absurdly low number considering the revenue generated by those signs. However, the new citywide sign ordinance scheduled for a vote today by a city council committee would raise the penalty to as much as $10,000 per day. Which is one good reason to get that arguably-flawed ordinance on the books. Are there other legal roads for Clear Channel and CBS Outdoor to follow to keep their digital billboards out of harm’s way? The companies have already been to federal court–in 2009 they sought a restraining order barring the city from taking any action against their digital billboards–but that foray met with no success. The political landscape, with its swamps and thorny patches and shifting cast of characters, is more uncertain. The aforementioned motion, which passed the City Council by an 11-3 vote, directed the city planning department and office of the chief legislative analyst to draft legislation and binding legal agreements that would settle the status of the digital billboards and provide the city revenue and other community benefits like the takedown of some conventional billboards. That motion, passed on Oct. 16, specified that this work be done within 30 days, but as of last week the unofficial word in City Hall was that neither department had even begun their designated tasks. In fact, the latest draft of the sign ordinance scheduled for committee discussion today includes a report stating that the planning department doesn’t have the resources to put together the desired legislation and legal agreements. It’s no secret that the billboard companies, in particular Clear Channel, which has 79 of the 100 digital billboard companies, have been plying city hall for months, holding out the promise of revenue which to the cash-strapped city is like dangling a meaty bone in front of a hungry dog. All the city council has to do is agree to let those digital billboards keep flashing their ads for cars, movies, fast food and other products and services despite the myriad complaints from neighborhoods about light trespassing into homes, glaring in drivers’ eyes, and generally helping create a Times Square-like atmosphere on some streets. Could the city do this, not withstanding an order from the court directing the city to revoke all the digital billboard permits? No doubt the creative minds in Clear Channel’s and CBS Outdoors’ legal departments have posed this very question and come up with an answer that ignores every consideration other than their bottom lines. That’s just conjecture, of course, but this writer with no taste for gambling would certainly bet on it.